In the million shaggy-dog stories that comprise my life, there is the story of how four boxes of  Tim Tams came hurtling around the earth, from Northcote, Victoria, to Menomonie, Wisconsin, through my door, into my hands, and thereby into my belly. In the manner of an Aristotelian proof  — offered by a person who has read precious little Aristotle — I offer this tale. h4. 1. What are the appearance and substance of the Tim Tam? If books were made of flour, chocolate, and sugar, this cookie would be Lover'>Lady Chatterley’s Lover. A naughty cookie, to be sure, it has little in the way of natural-foods credentials. The Tim Tam is a little smaller than a credit card, and about a centimeter tall. It’s small enough, in fact, that you know you’ll probably need another the moment you put the first in your mouth. 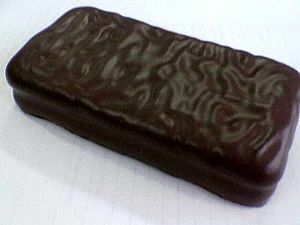 It is chocolate malted biscuit separated by chocolate cream filling and coated with a thin, textured chocolate shell. Chocolate + chocolate + chocolate. But what the heck — sometimes I like a naughty cookie or two. h4. 2. What is the source of the Tim Tam? The Tim Tam is a beloved cookie of Australia. When I asked my friend Lisa, an Australian whom I met when we were both exchange students in Belgium in 1986, what Tim Tams were, she was tickled enough by my ignorance to offer me a taste. In turn, I tendered a bottle of maple syrup. Ludicrous in one sense. Logical in another. We engaged in a trans-oceanic sugar exchange. Lisa and I had become reacquainted through that ubiquitous social-networking site that shall remain nameless. After telling the story of the last 25 years in 300 words or fewer, we started talking about food. Lisa saw my maple-syrup posts; I saw her raving about curries and cakes. Soon enough, she was posting about Tim Tams, and I was asking simple, leading questions, the long-distance equivalent of “Are you going to eat the rest of that?” And though we call our sweet snack foods by different names (she “biscuit,” me “cookie”), we relish them just the same. In my research for this piece, I learned that Pepperidge Farm is importing and marketing this cookie in the United States. I also learned that there is a phenomenon called the Tim Tam Slam. Sadly, I learned about this racy cookie maneuver after my Tim Tams were gone. h4. 3. What is the nature of the Tim Tam? What defines a cookie is its size and consistency. A cookie is a dense, compact hand cake, designed for ease of transport. Travelers are wise to pack cookies in their hobo kits, for cookies don’t hit the bloodstream quite as hard as candy. They provide, instead, a gentler ascent and a point of focus. I am much more likely to look at a cookie while I am eating it, whereas candy I just keep popping blindly into my mouth. I never got candy in my lunch sack, unless I was drawing down funds accumulated on Halloween, but I always got cookies. I also used to pack them when traveling in groups to keep fights from breaking out. Economy and mobility: these are cookie virtues. Yet the nature of this specific cookie, the Tim Tam, is also impulsive kindness and occasional excess. That is how I remember Lisa when we were 16. She is the one who convinced me to ditch the tour group and explore London on our own. Without her I would not have spent a lovely hour outside the St. Paul Boys’ School admiring the boys’ burgundy blazers in the raw February wind. Lisa was much braver and funnier than I was, and I’m sure I stole a dozen of her jokes before we returned to our respective homes. Her offer of airmail cookies was of a piece with everything I have ever known about her. Its improbability delights me as much now as her cheekiness did years ago. And it’s true that these Tim Tams were tasty. While they have been certainly drafted to serve a story, they also fueled several days’ scurrying through my oddball city of Menomonie. Because I don’t roam quite as far now as I once did, my cookies have to pick up the slack.